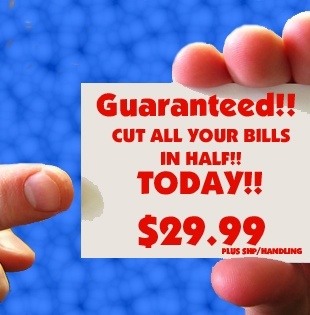 A man ran an ad for a system guaranteed to cut your bills in half. He claimed his system required no seminars, no training, and no legal fees. It was quick and easy solution. He promised that for $29.99 any and every bill could be cut in half. Unfortunately, people were disillusioned when they received their kit in the mail. In fact, there were so many complaints that the authorities did an investigation and they discovered the kit only contained one thing. What was the one thing the kit contained?? A pair of scissors. Yes, for $29.99 plus postage and handling the man would send people something that would cut their bills in half, but not in the way they wanted. Due to the pressure from dissatisfied customers, authorities eventually charged the man with mail fraud. Yet, here is what I really want to know. Why did so many people send $29.99 plus postage and handling without any knowledge or information about what he was selling except empty promises? Actually, I think I know the answer. Honestly, I see it all too often in the Church. Too often out of frustration, out of desperation, or out of fear of not knowing where else to turn, we talk ourselves into looking for a quick fix. We convince ourselves that there must be an easy answer. We sell ourselves on the notion that there must be a simple solution. We quickly buy into the idea that there must be a plan of action that will immediately solve all of our problems in one easy step. The most unfortunate thing is that when we buy into immediate actions to solve complex situations, we often cut God out of the equation all together. When we do not allow ourselves the time and space to seek God's guidance, wisdom, and direction, we can run the risk of making hasty decisions that are not only short sighted, but can be downright un-Christ like and will eventually cause more problems and pain in the end. The truth is the promise of a quick fix is always an empty promise. Complex problems do not arise immediately, and they cannot be solved immediately. I believe the best practice and the most faithful practice in facing such problems is to first slow down, breathe, and invite the presence of God into the decision process. The invitation of the divine will often mean the invitation for all of us to take a step back and be willing to wait until we are fully ready to listen to one another and ready to listen to the still speaking voice of God in our midst. Such resting and waiting upon the divine as well as the ability to listen to one another and to God at the deepest level enables God to speak to us and transform our minds, hearts, and spirits to make decisions that are more faithful. The next time we are tempted to act too quickly, too hastily in reaction to difficult situations that arise, I pray that we will not cut God out of our discernment and decision processes. For the promise of which the Apostle Paul reminded the churches in Corinth is still true for us today. It is not an empty promise.